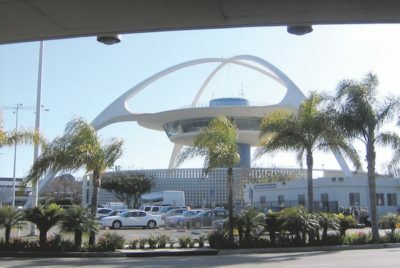 PAUL REVERE WILLIAMS was among the architects on the design team to create the new Los Angeles International Airport terminals in the early 1960s. Shown is the Theme Building. February is Black History Month, a time to celebrate the achievements of African Americans and their contributions to our community. The physical history of African Americans in Los Angeles is chronicled in the places where people lived, worked, worshipped and fought for civil rights and made notable cultural achievements. Late last year, the City Planning Department’s SurveyLA completed its African American context statement, a document designed to highlight the contributions and legacy of this significant group. My thanks to the team that worked so hard on this — the firm of Galvin Preservation Associates led by architectural historian Teresa Grimes with the contributions of historian Alison Rose Jefferson. The document (available at preservation.lacity.org on the Los Angeles Citywide Historic Context Statement: Context African American History of Los Angeles) presents important themes in the history of the African American community in Los Angeles from the mid 19th century through the 1980s. It identifies designated historic resources associated with civil rights, religious and social institutions, the entertainment industry, architecture, and more. Just as importantly, it identifies resources which have not yet been designated, showing how rich the population of resources associated with this group actually is. The stories are fascinating, and the resource pool very diverse. Like any category of historic resources, identification is key. Once identified, the stories associated with these buildings can be understood by the general public and celebrated. Many of the resources in the context statement have layers of history attached. Take the stories of the Dunbar Hotel, Angelus Funeral Home, Golden State Mutual Insurance, Bethlehem Baptist Church, and the Ray Charles Recording Studios, for instance. The Dunbar, a significant hub of Central Avenue, housed musicians and celebrities who could not find accommodations in the segregated city of the 1920s-1960s. The Angelus Funeral Home was founded by community businessmen to meet the needs of the community, as was Golden State Mutual Life Insurance. As for churches, Bethlehem Baptist (designed by R.M. Schindler), Second Baptist, McCarty Memorial, and First African Methodist Episcopal (FAME) all met the population’s spiritual needs while also playing significant roles in the civil rights movement. Ray Charles and other entertainers enriched the city’s major industry of music, radio, television and motion pictures. All of the above buildings have been designated as Historic Cultural Monuments, along with over a dozen others. Residences of the community’s leaders, among them Ralph Bunche, Claude Hudson, Nat King Cole, Leo Branton, Gilbert Lindsay, Betty Hill, Paul R. Williams, Lou Rawls, Ruby Dandridge, and others are designated landmarks or contributors to the Hancock Park, Country Club Park, or West Adams area Historic Preservation Overlay Zones (HPOZ). The contributions of architects Paul Revere Williams, James Garrott, Robert Kennard and Norma Sklarek are catalogued. Williams played a significant role in designing the city and hundreds of his buildings still exist, cared for by owner / stewards who prize his exquisite designs in a wide variety of styles. Look no further than the Hancock Park HPOZ where Bachman, Goodwin, Duque, Banning, Wilder and other residences stand. The churches continue to welcome congregations, the commercial buildings customers. Dunbar, the 28th St. YMCA, and, soon, the first Angelus Funeral Home, now provide affordable housing. The facilities are used, and the stories continue to be written. It is an important legacy in a city rich in diverse traditions. Christy Johnson McAvoy, a former president of both the Los Angeles Conservancy and the California Preservation Foundation, as well as an Advisor to the National Trust for Historic Preservation, founded Historic Resources Group in Hollywood.